Note: Sergeant Dugovic has never left G Co. during the entire 4th Division's combat service. He landed on D-Day as a PFC; he has never been wounded. At the commencement of the Hurtgen Forest battle, G Co. was in excellent condition and had a total of 5 officers and 180 enlisted men. Those men were some of the best that had fought with the Division; some of the men who had been wounded at Cherbourg and had returned. Lt. Twoney was in command the company. G Co. had been waiting back in assembly area to attack when the order came down. The attack was supposed to be awaiting an air preparation. When the order did come down there had been no air preparation in front of the 22nd Infantry and it had been decided to dispense with artillery preparation as it was considered that this would alert the Germans and give then time to prepare for our attack. It was hoped that at least we might secure some surprise by pushing off without the artillery support. With G Co. loading the 2nd Battalion's attack jumped off from a point approximately at 003373 at 1230 and moved northeastward through the woods. Formation of the company was a column of platoons with the 3rd Platoon leading. First contact with the enemy came when the scouts of the 3rd Platoon hit an outpost of the Jerries on the western slope of the hill (009379). This outpost was the factor that kept the Krauts from being surprised because after firing a few shots it withdrew and warned the reminder of the enemy further back in the woods. As the reminder of the 3rd Platoon came up on the wooded hill, it came under fire of about 3 machine guns. In this area there was a grove of small firs, very difficult to move and see through. The easiest route of approach, namely the firebreak, had wire stretched across it and we were unable to use it. Through the small firs the Jerries had cut fire lanes. This was done by cutting the lower branches of the small firs just high enough to be able to observe and fire down without cutting the tops out of these trees. Lt. Twoney came forward and ordered the 2nd Platoon to come up abreast the 3rd. He had these two platoons attack abreast straight to the east all the men running, assault firing, and yelling. This was sufficient to route the Heinies and we could catch glimpses of them disappearing through the hard wood further to the east. During this attack the only supporting fire that we had consisted of the howitzers of the Cannon Co. which fired ahead of us into the woods. Meantime the Krauts threw a few rounds of heavy mortars toward our rear and hit the Company CP which was back near the LD. At this time it is believed the Germans did not know how far we had advanced or exactly where we were so they didn’t throw artillery on our assaulting platoons. During the actual attack no Germans were killed or captured and it is estimated that we were opposed by 3 machine guns and by about one platoon of infantry. We overran two dug-in positions of the Germans in addition to the outpost where they had placed one machine gun. We lost 4 men, one squad leader of the 3rd Platoon having been wounded. The first scout of the 1st squad was wounded and the second scout killed. By 1600 we had reached a position generally on the east slope of hill 201 (017377). Our lines were extending north and south facing to the east and with one platoon facing to the southeast as right flank protection. This was considered especially necessary as we could observe Germans about 200 yards down to the southeast holding dug-in positions in the draw. During the late afternoon we captured 5 or 6 Krauts, one man having just received his ration of hot chow. A German Medic later came in from the direction of the German position. He was leading 3 wounded Krauts. Most of them were pretty old according to Army standards. It is thought that at least 2 of these men did not know that we were in the area and were trying to return to their units, they walked right into our arms. The others no doubt were tired of war. During the early morning hours the enemy began shelling with arty and mortars especially on our outpost. We in turn used our mortars to shell the Krauts down in the hollow and during the day we could observe a Kraut Medic walking around from dugout to dugout working on the German wounded. This indicated to us that our mortars were at least inflicting some damage. About 6 Krauts walked right up to our lines during the day and surrendered. These men appeared to be quite shaken up. We believed this was due to the mortar fire that had been placed on them. We in turn suffered a direct hit on one of our machine guns and lost one squad in its entirety. We did not attack on the 17th because the supply and evacuation problems were so great that we had to straighten them out before we could start again. Evacuation had to be made on makeshift stretchers. Our Weapons Platoon was used throughout the campaign as carrying parties for supplies and for evacuation of the wounded. This had to be done because evacuation was so difficult and so many men were wounded that the medics could not handle them all. Consequently most often the companies had to be responsible for evacuating their wounded back to some collecting point, in some cases the Bn. CP, or to a forward aid station where they were picked up by the medical carrying parties and carried back the rest of the way to the aid station. In order to serve as a guide to the various carrying parties we stretched white tape back from our forward platoon positions to the LD following the same route that we had traversed in our attack. The same route had to be followed area because this was the only area that we felt had bean cleared of Germans. On any other route we were not certain but that the carrying parties would have to fight their way through. In fact E Co. in moving through our left on Nov. 16th had not completely cleaned out the Krauts in the area thru which they moved on several occasions our supply men and evacuees were fixed upon by a German who had either remained in the area or had infiltrated back into the area. G Co. again attacked in a column of platoons with the 1st platoon leading. The 1st squad of the 1st Platoon went out through the hard wood directly to the front. The 2nd and 3rd squads attacked down toward the draw where the Germans were located. The platoon sergeant, who was with the 1st squad, was killed almost immediately and the squad found itself caught in a crossfire coming from straight ahead from an easterly direction and from the right flank. The 1st squad had to be pulled back as it became rather badly disorganized. The other two squads, after a fierce fight, overcame the Germans who had approximately 6 machine guns and two squads of infantry. We then had an opportunity to see the German positions which had been very well prepared with excellent overhead cover. The company then moved on toward the road and ran into a minefield at 019376. Mines had been placed up and down the road and one of our squad leaders stepped on a mine killing him instantly. Some mines had been placed right on top of the road in plain view. PWs told us that there were others in between and well concealed. It was decided then to move northwards and try to find another crossing. We crossed at 019379 crossing also the stream on the other side of the road about 1600 (which is about the close of the day this time of the year). We reached hill 313.0. We had maintained contact with E Co. all day. Just after we jumped off in the morning the Battalion CP was shelled wounding the Bn. Commander, Lt. Col. Walker. This was with very heavy arty. E and G Companies tied in on this hill for the night and around this time enemy patrols began moving up and contacting our front lines. Shortly after this contact was made, and at the same point, arty began falling. Also especially heavy shelling was received generally on the rear slope where we were located. On this day we held the same positions and sent out patrols to the front to locate the enemy's positions. We received a tremendous amount of enemy mortar and arty fire all day. Again we collected about 5 or 6 prisoners, men we drifted in during the day, probably because they had enough of our arty. One of our patrols, which had been sent out to cover the area generally across our entire front, returned and reported that it had found nothing. We were given an objective about 200 yards to our front. The 1st Platoon was to attack straight across towards the road, the 2nd and 3rd Platoons were to flank to the right through the ravine During the night and after our patrol had passed through this area the Heinies moved back into the area in front of us and dug in there. We jumped off at 0830 and advanced about 100 yards before running into enemy fire. The enemy was estimated to have 6 machine guns and a platoon of riflemen with a few bazookas. He also threw arty and mortars both on us and on his own positions. Before the battle was over about 25 Krauts had been killed and we had lost about 20 men and all of our officers, 3 killed and 2 wounded. The Germans had placed some snipers in strategic positions and one of these was evidently a crack shot as he knocked off several of our men. Some of the Germans too were armed with automatic carbines. About mid-afternoon an officer from E Co. came up to take over as Company Commander. After this two of our Medics were shot by the German snipers. Off to the right we could see a German tank being used to evacuate wounded. The tank was moving up and down the road which extends for a short distance along the 03 grid. After a while this tank moved up towards us and began firing upon us. Shortly after, long range arty began falling. At the end of the day there were 7 men left in the 3rd Platoon. The new Company Commander walked over toward E Co. which was on our left to make contact and was killed by arty. Early in the morning another lieutenant from E Co. came up and took over. There was no attack planned for the day and the company held on its lines. As usual there was a terrific amount of arty and mortar fire covering the entire area from just in front of our lines all the way back to the draw on the western slope of hill 313.0. This was designed to knock out our supply line. As to Company strength there were 33 men on the line, 7 in the 3rd Platoon, 13 in the 1st, 13 in the 2nd. We had been assigned some replacements but the 1st Sergeant, who had been ordered to bring them up, decided it would be best to hold them back until the Jerry arty had let up so that he could bring at least most of the replacements forward in good shape. About 22 replacements were brought up to the company. G Co. had been given the mission of furnishing right flank protection to the battalion and was ordered to tie in with F Go, which had advanced about 700 yards to the front. At about 0900, G Co moved out and almost immediately ran into a great deal of enemy mortar fire. The Germans pushed several tanks up the road running northwest from Kleinhau and these tanks fired upon us causing several casualties. From the area across the road in the general vicinity of the draw 033372 we received fire from about 5 enemy machine guns. This concluded the offensive action for the day and we advanced no further, as we had been ordered to protect the right flank. The 1st Platoon received 17 replacements. This time the 1st Sergeant, Sgt. Kennan, decided to bring the replacements up to the company. He started with somewhere between 15 and 20 and reached the Co. CP with 6 having had to bring them up thru a mortar barrage. The company again held the same positions for the day. The 1st Platoon was sent to furnish guards to protect the mine sweepers which were sweeping the firebreaks from our positions (extending from the road at 036373 to a position just south of the road 033373), sweeping from our positions back along the road and firebreaks toward a road running north and south across which we had attacked on the 18th. These were being swept so that we could bring our tanks and TDs up to protect us against enemy tanks and to support our attacks. Same operations were continued on the 25th. E and F companies advanced another 600 yards to the edge of the clearing west of Kleinhau. G Co. moved out to tie in with E Co. Although there was no fight plenty of arty fell all over our zone of action. The 3rd Platoon which had received some replacements was now back drown to 9 men. We tied in on the right of E Co. We could hear tanks in Kleinhau but did not knew whether they were enemy or friendly. On one occasion we saw a group of Heinies running across the field from the woods to our right and south of the main road to Kleinhau. They were evidently attempting to keep from getting encircled by our troops. E Co. moved up to assist Co. B in its attack on Grosshau. The Heinie Arty had been diverted by the 5th Armored Division’s attack on Kleinhau and most of its arty was falling in that town. Later on G Co also received a heavy shelling. Nov. 28th - G Co. remained in the same position. The company moved up into Grosshau where it remained for about two hours. With its LD on the main street of Grosshau it began its main attack at 1100 and immediately became involved in a fight with some Krauts who were still located at various places in the houses of the eastern part of town. Enemy also had a strongpoint at the crossroads at 055380. In this strongpoint there were several rifleman and a couple of machine guns. When we started off our guide took the wrong direction and led us off toward the woods in the 3rd Battalion area. A little later we got straightened out and came back to our area. We advanced toward the woods east of Kleinhau and dug in for the night about halfway from the main road to these woods. Off to the right the Krauts had had positions in a long trench which extended for about 200 yards from that strongpoint back towards town. These men had retreated into the woods. There was an 88 AT gun up in the edge of the woods to our front and the first platoon also spotted 5 tanks in the open area just south of the southwest corner of the woods. We had captured about 30 Krauts around the time that we had jumped off from the town. To our left we saw a Medic bringing in two young kids (about 13 years old) in German uniforms. They were carrying a stretcher with one of the their wounded on it. They walked down the road from the woods in the 3rd Bn. area to Grosshau and towards the general direction of our Bn. CP. On December 1st "it rained - arty.". G Co. was ordered to move up and tie in with A Co. It was not until late afternoon that this was accomplished. During the day we received one officer and 10 replacements from E Co. All of these were assigned to the 1st Platoon. We expected to receive a counterattack that night. About 25 enemy planes flew over Grosshau and across the fields to the east of Grosshau. They dropped anti-personnel bombs on the town and did some strafing but as far as we know the only damage they did was to knock out one halftrack. We think they were after the friendly tanks at Kleinhau. It was pretty foggy that day so the planes didn't come in too low. This was the day that we were to be relieved by the 330th Infantry of the 83rd Division and G Co. was required to send a guide for platoon back to the assembly area at the Y in the road (at 043383). The 1st Platoon was relieved at about 1500 and the others somewhat later in the afternoon. The company received some arty fire as it returned across the field toward Grosshau. 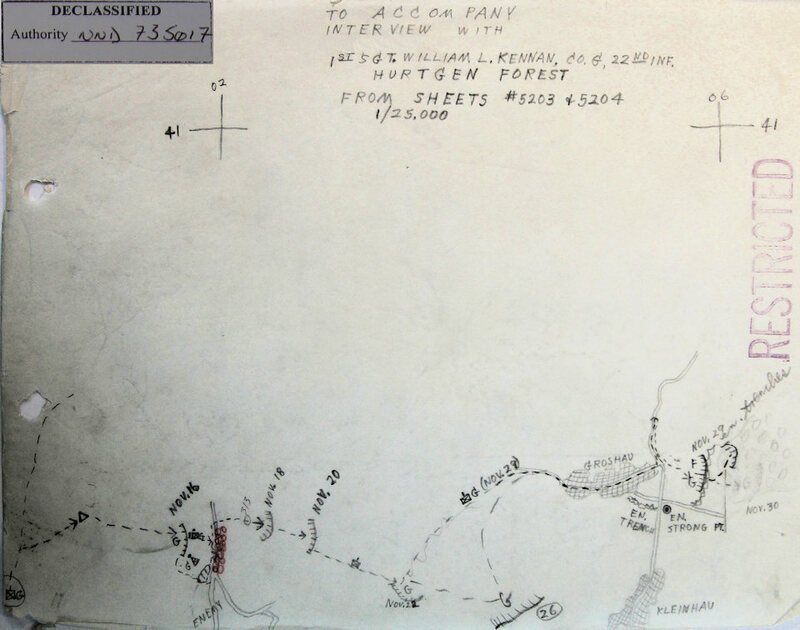 Map showing the advance of Company G, 22nd Infantry. The Company now has 3 Officers and 97 Enlisted Men). Many thanks to John R. Tomawski for providing me a bunch of documents from the National Archives.